A beautiful lilac maxi dress featuring a V neckline, a cinched in waist and a beautiful floor sweeping pleated skirt. The figure skimming shape creates a flattering silhouette, perfect for a bridesmaid this season. 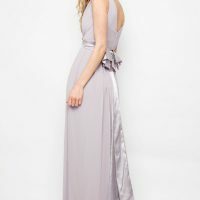 Myonewedding.co.uk is a UK destination to buy luxury high-street clothing and gifts designed for everyone attending a wedding. We offer a large collection of stunning pieces ideal for making an impact. From ivory wedding dresses, stylish wedding guest dresses to jumpsuits, trousers and accessories, we will have an outfit for every taste and budget.